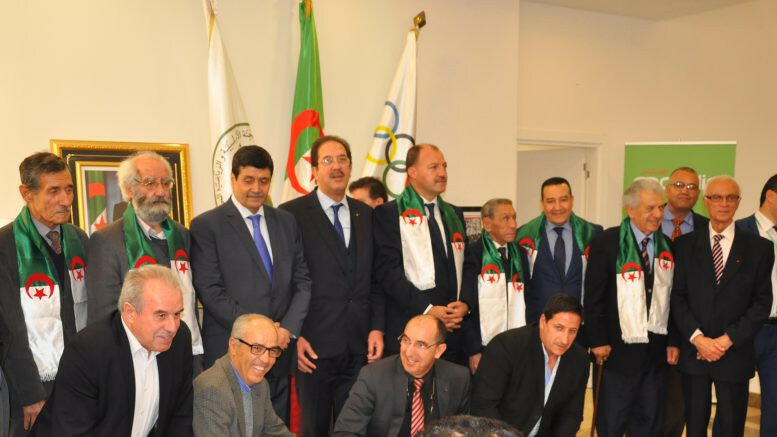 The 60th anniversary of the Algerian National Liberation Front (FLN) football team has been celebrated by the Algerian Olympic and Sports Committee (COA) at the Olympic Museum in Algiers. The FLN team, also known as "Le onze de l’independence" - the 11 of the independence - was made up mainly of professional players in France who sympathised with the Algerian independence movement and set up consciousness-raising matches against other national teams. Founded in April 1958, the team was a means of representing the Algerian cause. The French authorities moved swiftly to ensure the new "national" team was not recognised by the world football governing body FIFA. But, despite the prohibition on it, the FLN made a world tour involving around 80 matches in Europe, Asia and Africa until 1962, when Algerian independence from France was gained. The following year the FLN was transformed into the official national team of Algeria. Present at the commemoration were Mohamed Hattab and Tayeb Zitouni, respectively Algeria's Minister of Youth and Sports and Mujahideen. Mustapha Berraf, President of the COA, praised the FLN team. "The FLN was the origin of the national sports movement," he said. Hattab added: "The FLN team is an example and a pride for the Algerian youth, because the players have left the glory, the money and their family for join the ranks of the FLN to defend the national cause "
Zitouni, meanwhile, called on young Algerians to take example on the football team of the FLN. "I urge young Algerians and all football fans to follow the example of their ancestors who were a supreme example of sacrifice and love of the homeland," said the Minister. The COA paid tribute to four players of the FLN football team - Mohamed Mauoche, Said Amara, Abdelkrim Kerroumand Abdelhamid Zouba in the presence of the President of the Algerian Football Federation, Kheireddine Zetechi. Referring to the conditions that led to the emergence of this team, Zouba said: "This team was created to support the FLN through a message to the French authorities denouncing the occupation."